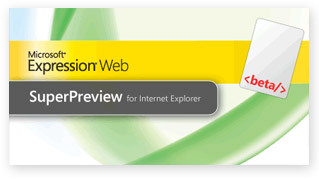 Microsoft has launched “Expression Web SuperPreview”, the name is typical of Microsoft products, it’s technically self-explanatory but mind-numbingly bland and ridiculously long. Guess Microsoft needs a SEO technic seriously. This product comes as result of Microsoft’s curiosity in the web practices. Its almost does the same as Meer Meer. But IE’s engine would be interesting part in this. Hopefully nobody can understand IE better than Microsoft. Well, whats my part in this? Why should i be very excited writing this ? Yes , I am very interested as its gonna be a important tool for QA Analysis where the browser comparison is the challenging task to run between the browsers , virtual machines and stuffs. Here too i guess there are no options to switch between OS. But still it makes sense to use it as a important tool. One of the best tool i love in firebug is the pixel perfect, with which we can overlay images and compare the layouts. Unexpectedly that has been a part of this Expression Web SuperPreview (Again a long name 😉 ). Yet to have a hand-on this tool. Will update things as i get used to this. Download Expression Web SuperPreview Trial . Have fun..